If you don’t know by now, I am obsessed with Christmas! Whether it is the spirit of giving, the multiple opportunities to get together with friends and family, all of the amazing decorations, or so many occasions to feed the ones you love, it all is so special and memorable. Favoring this time of year, I usually go a little overboard with all of my decorating. Just ask my kids!! 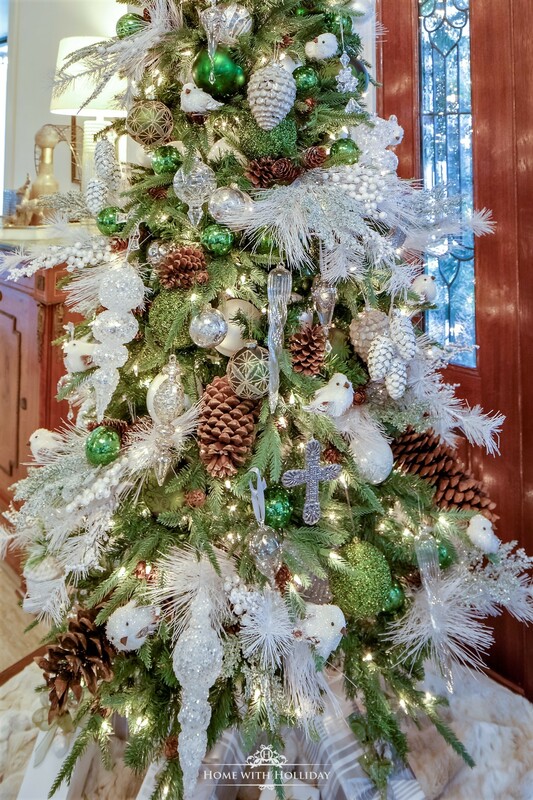 Today, I am sharing our Green and White Winter Christmas Tree that I am featuring in our entry hall. The story about what inspired the design is a fun one! Because everything that I do for the holidays, I MUST start early to get it all done. It drives my daughter crazy, but she is starting to understand. To get a head start, I decided to do a Thanksgiving Tree with Pumpkins (shown below). This way, one tree was set up early and could be easily transitioned to Christmas. In fact, I used several of the same pieces I used for this tree in my new one. Bonus! I reused all of the pine cones and the green ball ornaments. That is where the Green and White Winter Christmas Tree idea came to fruition! This past year, the tree that I featured in my entry hall was all white with touches of silver…very much a winter theme. I wanted to change things up a little bit. Since I used the pine cones in my Thanksgiving Tree, it seemed natural to carry that theme forward. Since pine cones are a natural element, I felt adding in the green tones made sense. These Sugar Pine Cones are huge and really made a nice addition to the tree. These are my new favorite glass ornaments from Sundance! My girlfriend, Kathy, gave them to me for Christmas last year and I just love them! Pro tip! One of the best ways to give your trees depth is to place a variety of sizes and colors of ornaments deep into the tree. Usually, I just place them into the tree rather than hanging them. This also makes the decorating process go a lot faster! Notice here that I didn’t use a traditional tree skirt. Instead, I used this super-soft Faux Snow Leopard Throw. It is larger than a normal tree skirt, plus looks a little cozier. Coordinating your gift wrapping also helps give your trees a “pro” look. It also shows careful consideration of how you are presenting your gifts to your loved ones. 1. Coordinate the colors of your wrapping with your theme. Mix prints and patterns, but in the same color palette. 2. Use coordinating ornaments to add a little splash of special to your gifts. 3. Use Christmas sprays or picks to accent your gifts. This little guy was only $1.00 from Hobby Lobby. 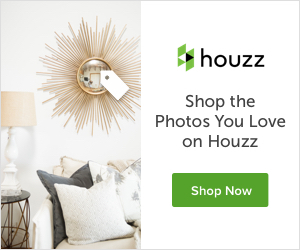 It really can help give your gifts a custom look without breaking the bank. I usually pick up small ornaments like these at the end of the season to use the following year to save a little money. I hope you enjoyed the ideas behind this Green and White Winter Christmas Tree! Have you wrapped up your Christmas decorating yet?! I would love to hear from you! Photography by David Garrick Photography. Thank you, Sally! I hope you have a wonderful day! I love how the green ornaments still pop even though they are on a green tree. It looks beautiful. Thank you so much, Haley. I think greens and whites go well together. Thanks for stopping by!! I love me some white and green on Christmas trees… So pretty, holly!